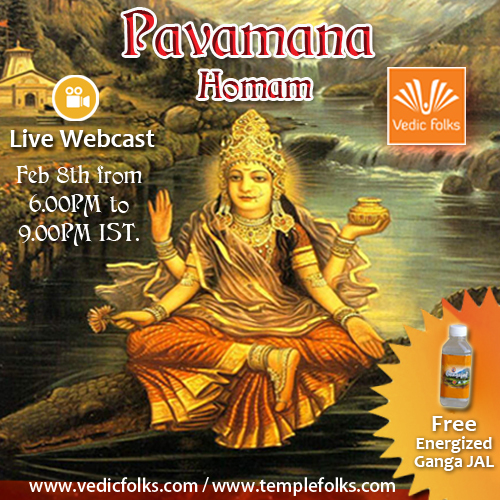 Pavamana Homam - Destroy all your sins now! Pavamana means invite purity by destroying sins. Pavamana Homam negates Sins, past karma and invites prosperity and purity to your life. Vedicfolks performing Pavamana Homam on the auspicious day of Thai Amavasya also called as Magha Amavasya or Mauni Amavasya to obliterate your Sins and Karmas. It is believed that the water of the most sacred and holy river, the Ganga, turns into the nectar on Mauni Amavasya day. Due to this belief Mauni Amavasya or Thai Amavasai day is the most important day in Vedic scriptures to take holy dip in the Ganges. Pavamana refers to a cluster or clang of Gods who can destroy your sins and bring in positivity and purity in your life. The clang refers to Lord Vishnu, Lord Hanuman, Lord Agni, Lord Soma and Lord Bharati and Goddess Ganga. These Gods are worshipped in this Homam ? a holy sacred pot. Pavamana is purified divine mantra of Rig veda. The sookthas and purity involved in this Homa is accompanied by the Rig Veda. It contains 7010 mantras which are referred to as Pavamana. By performing this Homa with chanting mantra once in a life time invites purity and prosperity in life. Pavamana pancha sookthas and vishnu related mantras are chanted during this homa. Ghee or sesame dipped in ghee also offered in the homa by chanting mantras. Sri pavamana mantras is the auspicious mantra when chanted it cleanses oneself from all sins and karmas. Homam Prasad from yagya centre. We at Vedic Folks are proud to possess the most authoritative experts who have the knowledge and ease to invoke these powerful radiations which can bring exact results and all kind of fortunes in life!